On this episode, we sat down with Dr. Sam Jethwa (Instagram: @dr.samjethwa). Dr. Jethwa is an award-winning cosmetic dentist in the UK. He has garnered over 291 reviews on the popular UK review site, Trust Pilot. 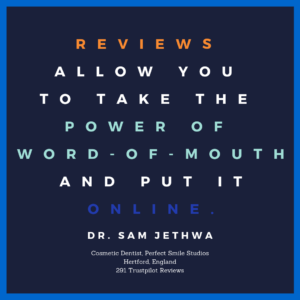 He discusses how reviews are just a reflection of the care you are providing in your practice. How are reviews over in the UK? What are the major platforms that people turn to read reviews? Where do you focus on getting reviews? What do you do to provide an excellent patient experience? Do you use any software or processes to make getting reviews easier? If you were placed in a new practice with no reviews, how would you go about setting up a system and training staff? I am a full member of the British Academy of Cosmetic Dentistry (BACD) and American Academy of Cosmetic Dentistry (AACD), and currently sit on the Education Committee and Chair the Young Membership Committee at the BACD. My involvement in the BACD allows me to remain at the forefront of minimally invasive cosmetic dentistry along with maintaining and developing my clinical skills. I am a member of the Royal College of Surgeons of Edinburgh, and am a qualified clinical teacher trained by the Royal College of Physicians and Surgeons of Glasgow. Hamburg is the home of dental materials company DMG, and I have been invited to visit them for their highly regarded focus group where opinion leaders at the forefront of modern dentistry will come together. My real passion and drive comes from realising the dream for my patient and making sure each patient is as happy as they can be with their experience, whilst fully aware that as their dentist I have their health, and motivating factors in mind. Ethical dentistry can go hand in hand with cosmetic dentistry and that is what I believe in. Should you choose to make a visit, you will be made welcome, and myself and my team will work with you to realise your dream through a safe, fully informed, evidence based, and relaxed journey.